Norwalk Federation of Teachers President Mary Yordon closes out Tuesday’s Board of Education meeting with comments on restorative practices, illustrated on the screen behind her. NORWALK, Conn. – Norwalk Public Schools is poised to take a new approach to student discipline, beginning in the middle and high school levels. The Board of Education on Feb. 19 is expected to approve a revised code of student conduct along with restorative practices, a system of relationship building between teachers and students, and student to student, to help students learn to take responsibility for their actions, understand what they’ve done, and repair the damage. “The old mentality was, ‘a kid acts up, just get them out of the building,’ and that just simply doesn’t work in our current approach. We need students in the building if we are going to close achievement gaps and build the learning that we hope for and expect,” Chief of School Operations Frank Costanzo said at Tuesday’s BoE meeting. Expulsions spiked from 1,045 in 2014-15 to 1,490 in 2017-18, prompting the formation of a Committee to study what could be done, Costanzo said. In addition, NPS hasn’t updated its disciplinary rules since 2012, and the code of conduct has been marked “draft” since April 2012 when the Board of Education did not approve a drafted revision, Norwalk Superintendent of Schools Steven Adamowski said. Suspensions have dropped this year due to new strategies, Roton Middle School Assistant Principal LaShante James said. Each of the high schools has one more suspension in this school year than in the same time period in the previous year, going from seven to eight. 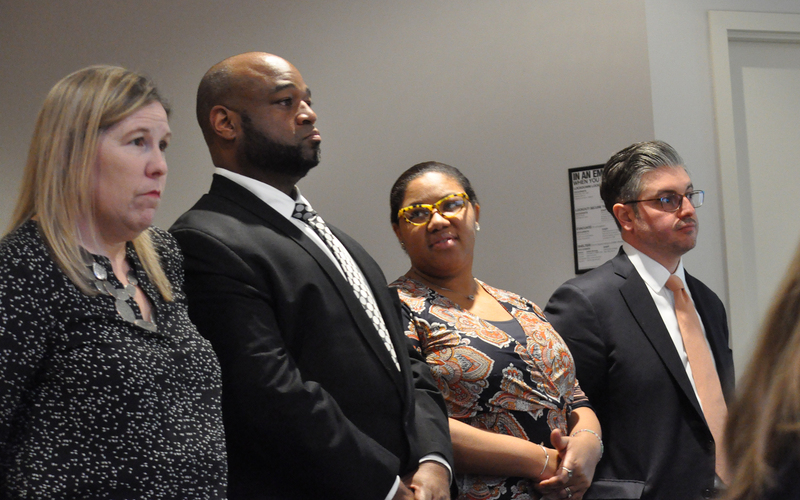 From left, Brien McMahon High School Assistant Principal Barbara Wood, Norwalk High School Assistant Principal Edward Singleton, Roton Middle School Assistant Principal LaShante James and Norwalk Public Schools Chief of School Operations Frank Costanzo, at Tuesday’s Board of Education meeting in City Hall. “Exclusionary policies should be policies of last resort because any missed time negatively impacts that child,” Brien McMahon High School Assistant Principal Barbara Wood said. Restorative practices is an emerging social science studying methods to improve relationships, Costanzo said. Norwalk High School English teacher Louis Shede explained that he attended an inspiring training session, and has since started some of his classes with a “circle”. He sits in a circle with his students and they discuss events and everyone listens to each other. A teacher explains how they felt when an incident occurred, and students see where they’re coming from, he said. “Now I am able to move through my lesson more efficiently and … it’s a calming affect… there’s a sense of relief and students can move forward,” he said. In addition to presenting two videos to the Board, administrators introduced two high school students who spoke of the positive effects of restorative practices. Alejandra and Leslie, NHS sophomores, said their friendship had deteriorated to the point of police being called to the school, due to many rumors flying about who said what. When administrators talked to them one-on-one, “It felt unfair, I didn’t get to speak,” Alejandra said. When a circle was employed, “I felt like I was listened to, I was listening to Leslie. She heard my feelings. It fixed the problem when talking individually didn’t help us at all,” she added. Instead of the “almost fight,” their friendship has mended, and Leslie gave Alejandra a ride to the Board meeting. Female Board members indicated enthusiastic support. One of the videos, shown below, mentioned the effects of disciplinary practices on other students. 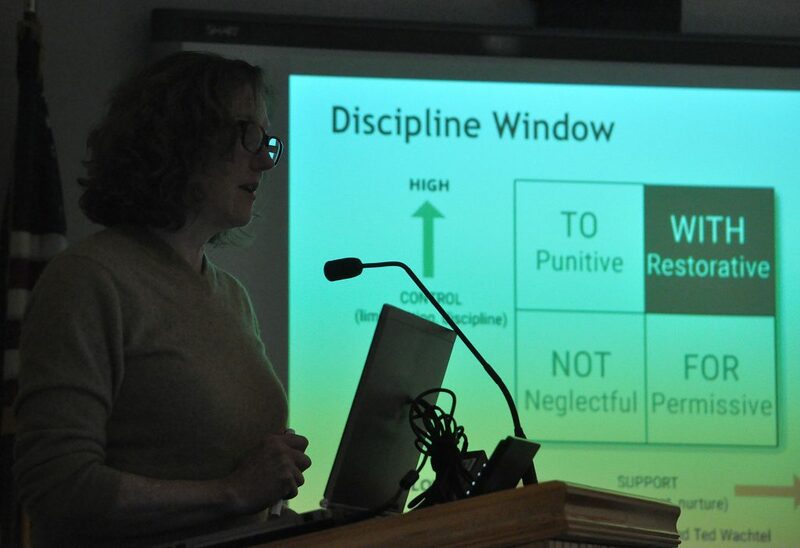 Sarah LeMieux observed that traditional discipline can create a negative idea of a “problem child,” and exclude that child. Adamowski said he and Chief of Specialized Learning and Student Services Yvette Goorevitch are appointing a Committee to study guidance services. “What we will need is a whole lot more guidance counselors if we don’t resolve what goes on in every single class… to keep those kids in class and learning,” Bruce Kimmel said, also indicating support for restorative practices. “I have heard from various sources that … we are not enforcing rules, we are kind of looking the other way,” Chairman Mike Barbis said, asking if students are getting a free pass so that the numbers go down. Adamowski said work needs to be done. The American Federation of Teachers is “all in” on restorative practices, aware since 2014 of the effects of disciplinary practices that tend to “demean and criminalize,” she said. Interesting approach but again, I think there seems to be a few things missing. First, where is the analysis on WHY the student was or are being suspended? Can the numbers be looked at from 10 years prior and analyzed in context of school population and make up? Of those suspended, which are repeat offenders? Do the offenders fit a Pareto type distribution aka 80/20 – 80% of the suspensions coming from 20% of the students. Aside from the Chicago Public Schools profiled, what schools in Connecticut have taken this approach? What were their challenges, learnings and successes? How will success be measured in NPS beyond simply Number of Suspensions? How long does a typical “circle” session last? How much in-class time will the “circle” sessions take, per day, per class, per grade? What criteria constitutes the need to “circle”? Throwing crayons? Swearing? Shoving? Bullying? Vaping? Sexual harassment? Are kids and non-offenders who are there to learn and act responsibly forced to join the “circle” as well? How has “circling” helped the kids who are on good conduct and at very low risk or not exhibited bad behavior? Most importantly, do mom and dad BOTH have a seat in the “circle”? I feel like more and more parenting, including feeding, are being outsourced to the schools – parents are checking out or at the other end of the spectrum, blaming the school for Trainwreck Tamika and Jackass Johnny’s issues because, after all, they really are angels at home. What restorative processes will take place OUTSIDE of school – that is, what is the plan for message reinforcement at home? Is there post-“circle” curriculum for parents who also shirk responsibility and common decency? Interesting concept, I look forward to seeing the success and results being published. Does anyone ever look back 15, 20, 30 or 40 years ago to behavioral strategies implemented in Norwalk? What is new in Norwalk is actually old. Only the cast of characters has changed. Educators appear to recycle old strategies in hopes of new outcomes. When will we learn? Didn’t I read somewhere that guidance counselors were being cut?